A woman deserves choices, and we’re here to please. Seventh Generation offers a full line of Free & Clear maxi pads, ultra thins, pantyliners, and tampons to deliver reliable protection for all of your needs. 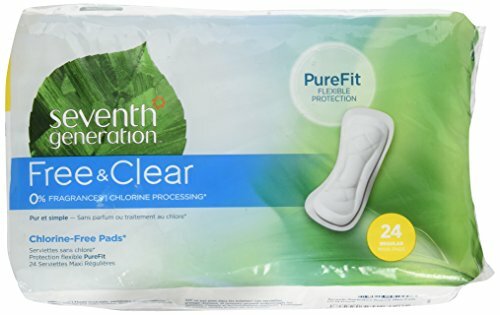 Seventh Generation Free & Clear Maxi Pads feature our innovative PureFit™ design for an enhanced fit that safely traps fluid away from the skin to keep you dry. Our feminine products are made without fragrances or deodorants and are processed chlorine-free. These hypoallergenic fragrance-free maxi pads are gynecologist tested and made for your most sensitive skin. On average a woman will use 16,000 tampons or pads over the course of a lifetime. You read that right – that’s 16,000 intimate encounters with your most sensitive area, so knowing what’s inside those products is a big deal. For over ten years, we’ve been making comfortable and reliable Free & Clear feminine care products and voluntarily disclosing the ingredients we use to make them. The thing is, federal law does not require us to do so, but we think they should. That’s why we’re advocating for mandatory ingredient disclosure in feminine care products with the hopes that someday the entire industry will follow our lead. Until then, we’ll be fighting for your right to know while offering a full line of pantyliners, pads, and tampons designed for your peace of mind and protection – period. *Process chlorine-free pads. Peel strip whitened with chlorine-containing chemicals.